If I could recommend one book for everyone to read to grasp the connection between economics and public policy, it would be Henry Hazlitt’s volume, Economics in One Lesson. It offers a basic, accessible explanation of why so many attempts to regulate the economy don’t work. Though laws are certainly necessary, the failure of many laws is due to a focus on the legislature’s immediate intentions rather than the long term impact of the proposed policy. 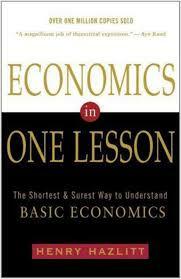 Though the book is not a theology of economics, its main thrust resonates with scriptural principles. The reader does not have to agree with all of Hazlitt’s policy preferences to recognize the value of his long-term view of the universal good and see how they help fulfill authentic justice. Basically, Hazlitt’s lesson boils down to two principles: 1) thinking about the long term good instead of the short term good and 2) taking everyone’s good into consideration. Both of these principles resonate with Scripture. Some advocates of so-called social justice, including some Christians, argue that immediate action to change significant economic policies in order to provide a rapid solution to a perceived economic problem is necessary. In many of these cases, however, the long term impacts of the new policies are not fully considered. Looking for long term consequences instead of focusing on short term effects is biblical. Interpreting Proverbs is a bit tricky since they are not absolute, universal laws, but general truths that may have apparent exceptions. However, without pushing this text beyond its primary meaning, it is clear that long term planning is being lauded by the author of this proverb. The context of these verses is about the cost of discipleship, but Jesus is urging his audience to consider the long term costs of their discipleship, not just the apparent immediate benefit. That Christ uses an economic example to illustrate his spiritual point demonstrates the validity of the economic principle. Some Christians try to argue that social structures should be preferential toward the poor or others who have real or perceived disadvantages. For example, in the minds of some activists, social justice requires progressive taxation and redistribution of wealth in order to benefit the poor. The rising tide of socialism among the “young and woke” crowd seeks to confiscate and redistribute wealth according to their desired social order, which is intentionally designed to harm the rich (or those that they choose to label as such). The passage then goes on to explain that you can’t passively ignore the good of your enemy by failing to return his lost property (vv. 4–5), that you should not lean toward the benefit of the rich against the poor in seeking justice (v. 6–8), and that the sojourner, the foreigner in your midst, should not be oppressed. Justice is the main theme. It is apparent that manipulating social structures for the benefit of a special interest group is not a path for universal justice. This means that creating a system that benefits the rich is bad (and this is a major danger of our current system of crony capitalism), but that attempting to punish the rich through taxation (as socialism tends to do) is also evil. The basic thrust of these passages is that social systems, including economic systems, should be oriented toward even-handed justice. Though more could be said about Hazlitt’s One Lesson, I have come to the conclusion that there is warrant for claiming that Hazlitt’s principles resonate with biblical justice. His examples help show why some of the well-intentioned policies proposed by so-called social justice advocates are really detrimental to a holistic system of justice. It is important, therefore, that we begin to seek a system that does not intentionally harm one group for the benefit of another and that we look at long term consequences, including systemic incentives created by social programs or convoluted tax systems. Only when we begin to ask these important questions will we be able to find legitimate answers to them.